Jacinda is a draki—a descendant of dragons whose greatest defense is her secret ability to shift into human form. To save the life of the boy she loves, Jacinda did the unthinkable: She betrayed the most closely-guarded secret of her kind. Now she must return to the protection of her pride knowing she might never see Will again. 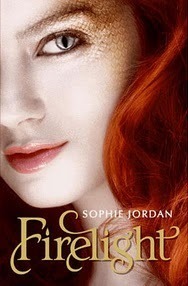 Firelight: I didn't expect to like Firelight because of the unbelievable hype it got, but I really really did. Let me be clear about something here. A book having tons of hype is not a bad thing. Readers having expectations that these books are actually worth said hype, is. Anyway, yes. I liked Firelight. First off, it's about dragons and I haven't read any other YA dragon-centered book. I don't think there are a lot of them about. First couple of pages in I was relieved that the protagonist, Jacinda, new from the start that she is a dragon, or should I say "draki", and she lived in the draki world all her life. I prefer that to the character learning later on in the book "Oh look!I can fly!" I generally liked the story but honestly, it was all too similar with Andrea Cremer's "Nightshade". Jacinda like Calla have to be "alphas" of their species and in order to do that they have to "mate" or "bond" with the male alpha, Ren, or in this case Cassian. Until they find a boy from the outside world, Shay/Will and fall in love with him with dire consequences, of course. 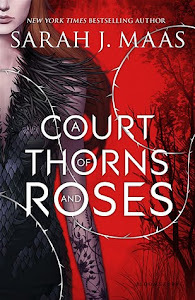 I didn't mind that it was similar because surprisingly enough, it was better than Nightshade. Jacinda payed little to no attention to Cassian so the pathetic love triangle was non existent. It's way better to read of a protagonist who knows what she wants and goes after it instead of one that goes "Um, what? I have to decide? No. I don't want to. Let them do it for me. They are both so hot, you see." At one point in the middle of the book I was a bit worried about the whole "I sensed him, I know he's in the room before I see him" crap, but fortunately it had a sufficient explanation in the end. Characters I found most interesting is that of Cassian, his father Severin and Jacinda's mother(whose I can't remember the name right now).Especially her mother, I don't know. One minute I think she is so cunning and knows tons of secrets and the next that she is totally useless and a bad mother essentially. 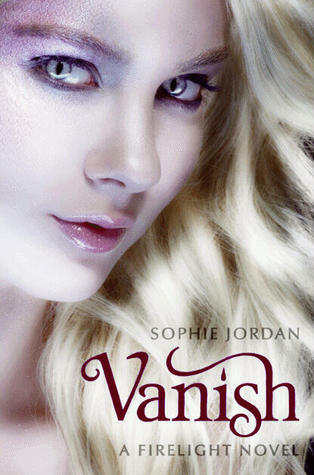 Vanish:Vanish was as good as Firelight. Maybe even a little better towards the end. Cassian, who we see a lot of in Vanish, is a complex character. Is he good, is he bad-what's his story? He seems honest about his feelings towards Jacinda, but then again he's his father son and he comes across so cold and distant that I believe draki will always come first for him and that's not what Jacinda wants. Now her mother is another story altogether. Her character fascinated me from the start, not in the sense of me liking her or not but more of wanting to see what will happen to her, her development after everything she's been through. I think in Vanish she just quit. She admits to herself that she has always been unhappy, being someone she didn't wanna be-that's why she let her draki die, and when she thought that maybe she could make a new life for herself she gets drawn back in the hell she took so long to escape from. She becomes a ghost of herself and loses control. In conclusion, Firelight and Vanish are two fast-paced, easy reads, that you don't want to put down. Vanish doesn't have a cliff hanger per se but we are left in the middle of a very important something and I really wish I had book 3. I've no idea when it comes out, but surely not soon enough! *Vanish was given to me by NetGalley, free of charge. I also enjoyed Firelight! I thought it was very unique, and I do love dragons! I can't wait to read the sequel. I really like how Jacinda has to struggle against everyone, even her own family, to stay true to herself and hang on to her draki. I guess the only bit I could have done without is the cliffhanger, lol, but that speaks for itself.